Faux Fur Bear Footrest - - Faux fur black bear footrest invites you to prop up your feet and relax. Dimensions: 30"L x 11"W x 19"H; weighs 9 pounds. Stuffed with poly fill and covered with imported fabric; framed, stuffed, and finished in USA. I bought this a a gift for my sister. I have one and she just loved it. It is sturdy and made well. The young grandchildren just love sitting on it. Also Comfort House had the best price! 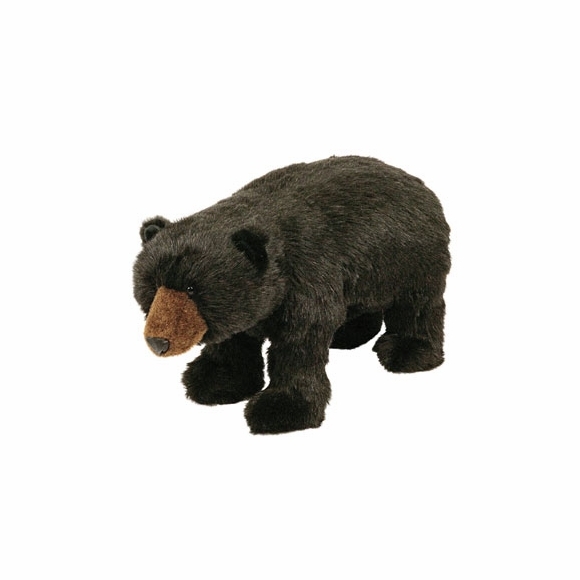 Comfort House had the lowest price and the bear was shipped out quickly. Previously, I had purchased one through EBAY for more money but after waiting a month to receive it, got my money back. Well made and sturdy as well as darn cute! This is a high-quality product. Very well constructed and a great look. Of most of the bear foot stools I researched, this one not only looked the best and most realistic, but it also received the highest ratings. After purchasing it for my wife for Mother's Day, I know why. Very well packaged and shipped quickly. I highly recommend this product if this is the look you are going for. My husband picked out this wonderful footrest for our Cabin in Northern Michigan. I would highly recommend this product! It is very realistic, made sturdy with high quality materials! Comfort House had our order to us in a few days during Christmas rush! Outstanding! Love this footrest! Looked at others but some of them have a funny face, this one is the best looking. It is sturdy but not heavy. It makes it fun to put your feet up and adds to our "lodge" decor! Love this foot rest! He's sturdy enough for me to sit on it! One of my dogs loves to try and get him to play! Perfect whimsical addition to my living room! We recently had to discard our recliner/sofa for one without that function and I wanted a footrest. As soon as I saw this guy I wanted one! Comfort House has the best price and fast shipping. Everyone loves him! This bear is absolutely adorable! I bought it for use in our new camper. It is very sturdy and comfortable. Would definitely recommend! We just love this fun and functional footstool. I recently hosted a "Rock for Barack" fundraiser and all my guest loved this footstool. This is exactly what we have been looking for and the price was right. Everyone who visits loves it. I am very pleased with the black bear footrest. It arrived swiftly and we use it everyday. It is very well made and is also quite sturdy. Besides being functional, it adds a whimsical touch to our family room. Very comfortable and sturdy! Looks great in any decor. I would highly recommend COMFORT HOUSE products for their durability and value. My husband has wanted a black bear footrest for 10 years now... I finally gave in and I'm glad I did. I looked online for a while before choosing this one and I was very pleased. Hubby (and the kids) love it! I intended on banishing it to the "man-cave" downstairs, but it is of such a fine quality that it has made it's home in the living room and has become quite a conversation piece! I have been looking for this footstool for months and finally found this one from Comforthouse. We love it. It really adds to the cabin decor and the grandkids think it's a great plaything.